aerosol and radiation experiments including TRMM, POLDER and EOS-AM. the impressive momentum behind this project. budget under these two components. *It can be done at about $ 4.5 to $5 M, or roughly 70% of the cost of the full program. sondes from NCAR. We have assumed that NSF will pay for these items. data integration. These will be paid by C4 from base funding to C4 from NSF. *It does not require ER-2 or  WB-57 or NOAA P-3. *It requires NCAR C-130 and Dutch Citation-II (already approved by the Dutch Govt.). direct and indirect aerosol forcing. *All other surface and satellite platforms are as mentioned in the US proposal. regional scales of relevance to climate studies. implementation in the present context is described further in the attached section. US proposal including objectives 2 and 3.
a high altitude aircraft ( WB-57 or ER-2) and NOAA-P3. diabatic heating for the ITCZ cloud systems. This program is listed in full in the US proposal. and India (for data on 3 Indian stations and ship) to gather data that will help fill important gaps. description is given separately as part of this plan (available by March 18th). aircraft (C-130 and Citation) over the same air-mass at near real time (subject to safety constraints). US government and WMO policy. This policy is being drafted by S. Williams (UCAR) and A.
by the science team) and will be placed on WWW through CIDS. ranging from 1 (must have) to 3 (highly desirable). measurements made from surface-based stations, satellites, and aircraft. launch, VIRS and CERES) will be used to infer the direct effect of aerosols on reflected sunlight. the direct and indirect forcing for the Indian ocean. The aircraft campaign is crucial to the accurate characterization of the aerosol forcing. radiation, cloud and aerosol properties (see Table 6a of US proposal, hereafter described as USP). 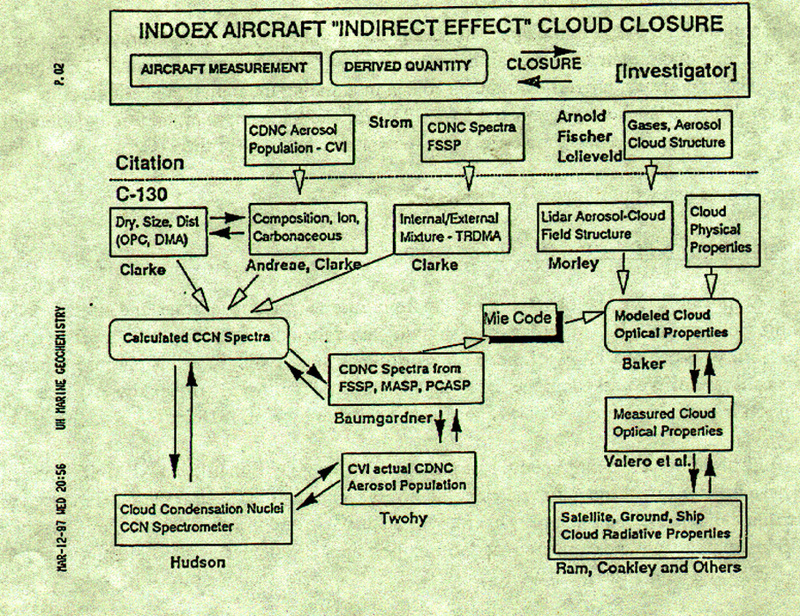 Indirect Effect Closure flights, during which low-level clouds will be profiled  for indirect effects. will provide the much needed redundancy in aerosol measurements in the lower troposphere. surface, aircraft, and satellite radiometers. 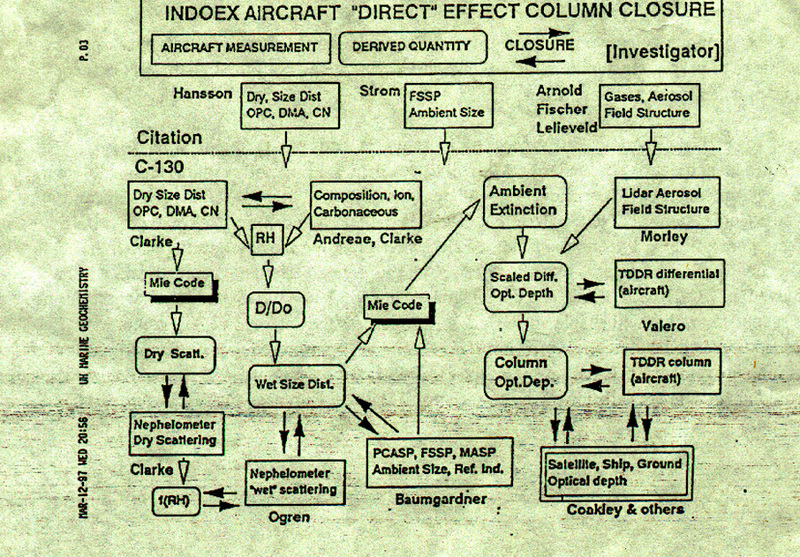 the cloud layer are to be accounted for through observations of conserved tracers by the Citation II. systems during the vertical probe. The INDOEX Science Team (the authors of the INDOEX proposal) would invite Drs. J.
properties of cloud droplet nuclei. from a ship, an island or aircraft. developed nations to assess the effects of pollution on global change.